Variety may be the spice of life, but there’s something to be said for figuring out what you’re good at — then doing it well, and often. In the case of entrepreneur Miguel Conde and architect Cristina Martí, the Spanish power couple behind Boutique Hotel Can Alomar, the skill in question involves transforming antique Mallorcan mansions into contemporary boutique hotels. They pair already designed two popular hotels in Palma, Hotel Can Cera and Boutique Hotel Calatrava. Can Alomar, opened in 2014, is the third in a series. 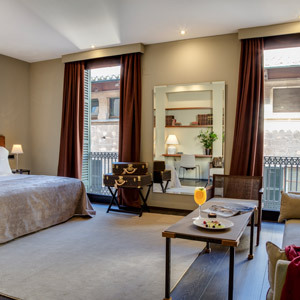 Can Alomar is situated in the old walled city of Palma, like its sister hotels; the building, considered a historic landmark, is a 19th-century neo-gothic palace noted for its spectacular facades. There are just 16 rooms and suites, a wise choice — this is a romantic place, and a grand one, not the sort of place where you’d want to squeeze in more guest rooms just because there’s enough square footage to do so. Still, the look is more modern than you might expect: rooms are simply outfitted with wide-planked hardwood floors, clean lines, and a neutral color palette. 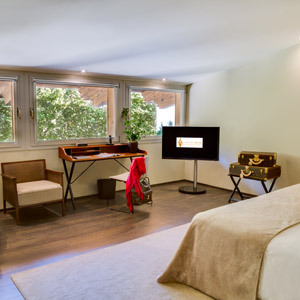 Standard rooms, with king-sized beds, Smart TVs, walk-in closets and Bose sound systems, overlook a flowering central courtyard or the Passeig del Born. Junior suites offer more living space, and at the top end, a trio of Can Alomar suites feature separate living rooms and extra perks like an Illy coffee maker and complimentary tea service. Public spaces are more atmospheric, from the cozy library to the sophisticated lobby lounge. Japanese-Peruvian cuisine, in a somewhat surprising turn, is served in the second-level restaurant. On the top level is Can Alomar’s crowning glory: the Solarium Terrace, complete with a spa, a small swimming pool and jacuzzi, not to mention the Viewing Tower, a dedicated lounge space where you can gaze down at the bay, the mountains, and the royal palace and consider Palma’s history. It’s a city with royal pedigree that later fell out of favor with the aristocratic set; today, the Balearic capital is a spectacularly charming place dotted with postcard-perfect plazas and carefully restored Gothic churches. 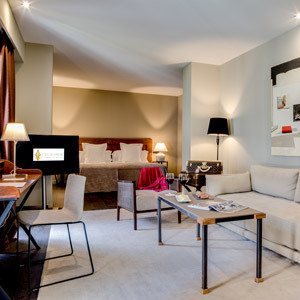 The hotel’s location on the iconic boulevard of Passeig del Born, lined with leafy trees, elegant cafés and window displays by Louis Vuitton, is a reminder of just how far Palma has come since the down-and-out-years.